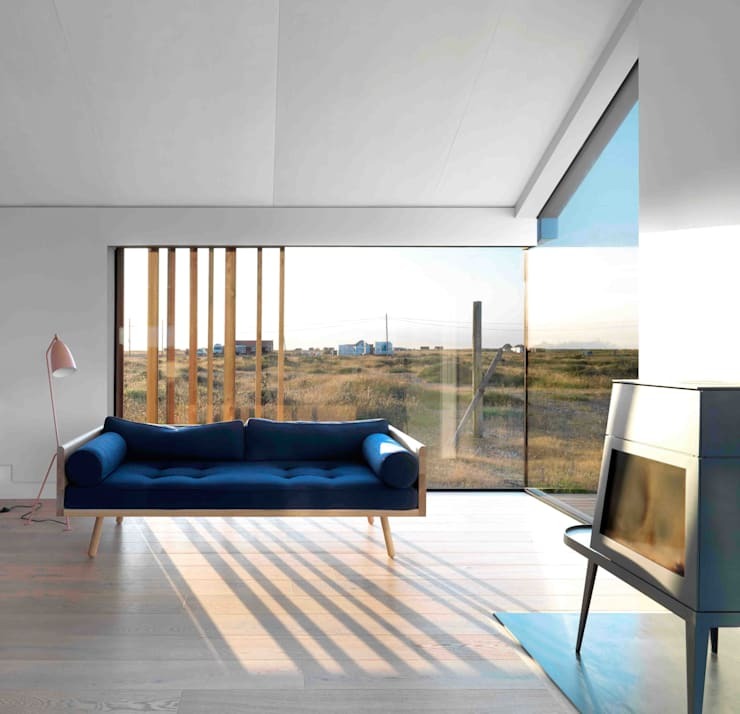 Today on homify 360 we head to south-east England, in search of the iconic Pobble House designed by British architect Guy Holloway! It is not very well-known that this area in England situated in the Dungeness National Reserve, is actually a desert! The flat and barren region is home to a large number of birds, including a variety of seabirds. The dry terrain of this seaside area is surrounded by gravel land and desert plants, with the exception of a few rustic beach huts and old abandoned fishing boats, showing that this area was once a bustling fishing town. Yet somewhere within this landscape is the surprising home that we are set to discover and explore! The architect and his excellent team decided that the protection of the local flora and fauna is imperative to the surroundings of this stunning home. As a result of this decision, the building was constructed by means of cement pillars and a raised terrace is located at the south-end of the building. The sand coloured wooden façade blends in well with the surroundings and dry landscape of this functional and environmentally friendly home, while making it attractive and eye-catching too! From this angle we catch a glimpse into the well-lit and modern interior… but more on that later! The home has been built from a number of carefully selected materials. 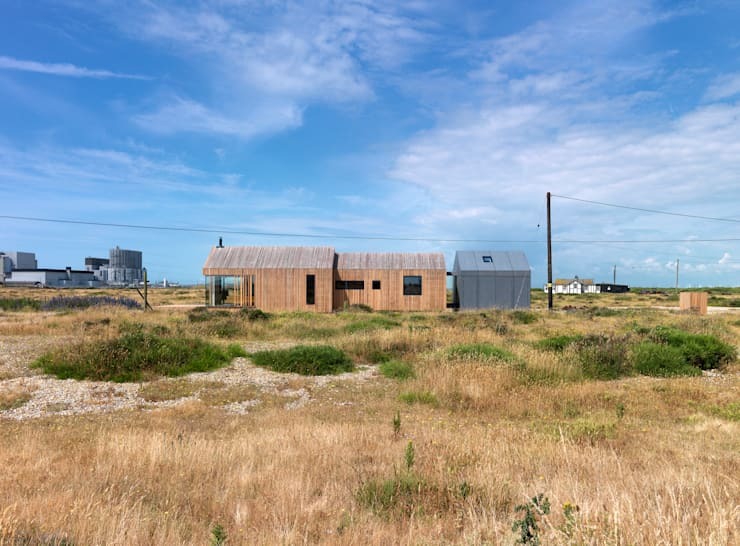 The façade is made from used larch wood, which will take on a silver-like colour over time, especially since the home is under constant influence of salty sea-air and strong winds. 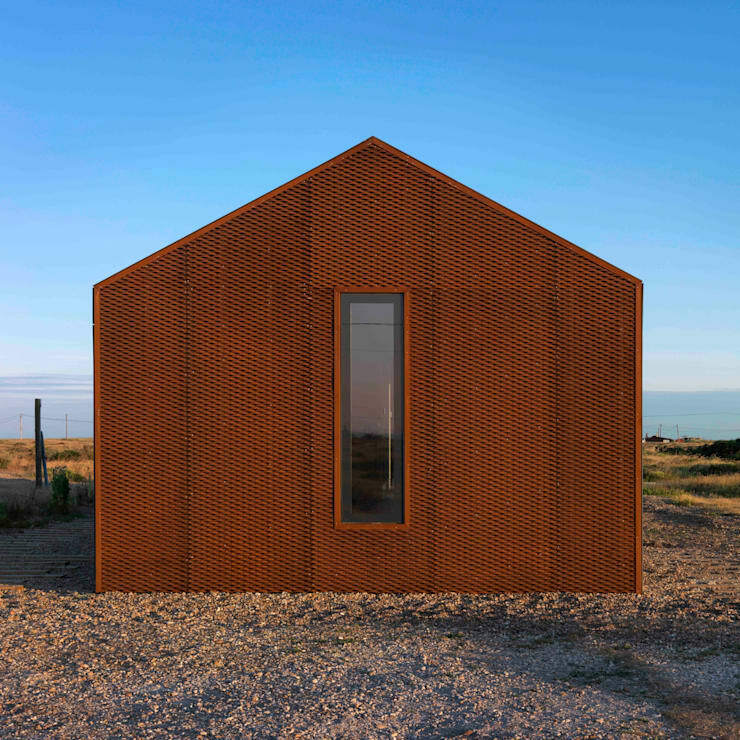 Steel has also been used in the construction of this home and due to weathering and time, this material will eventually discolour. This effect will create a more rustic-looking exterior, the house will look more and more like the abandoned houses that can be found throughout the surrounding area, but the interior will still be amazing! The materials used in both the interior and exterior of this beautiful home have been carefully selected. The use of lighter toned elements inside the cottage allows for excellent reflection of light, especially with the large amount of windows included throughout the living room. 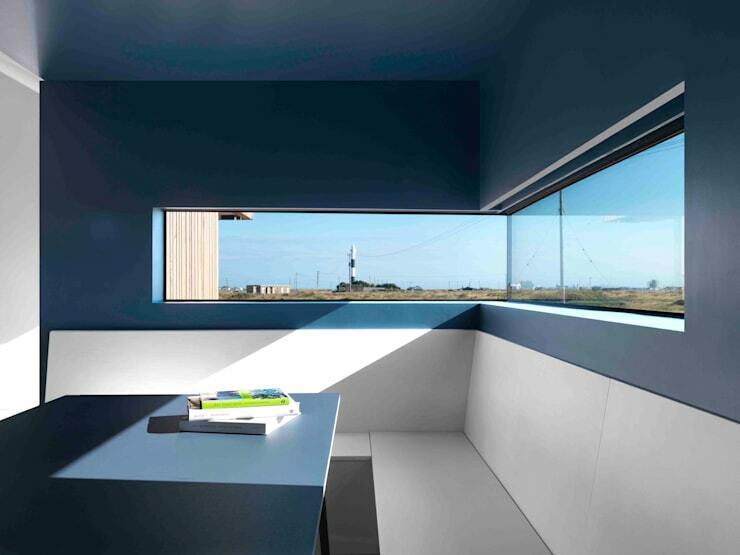 The orientation of the home is directed to the nearby lighthouse, with almost each and every room enjoying the panoramic view of the landscape. The modern minimalist and simple use of furniture, to create a comfortable space is clearly evident in this image! This home boasts Scandinavian inspired furniture, allowing the minimalist design to take on a cosier edge. 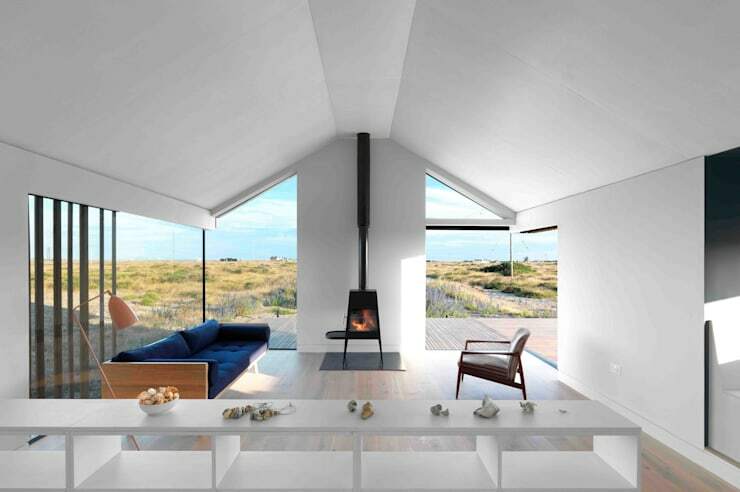 The modern wood stove is the perfect addition to this home at the seaside, as temperatures are known to drop to levels far beyond comfortable, especially on cold winter evenings! Before this unique home was built, the architects took the surroundings and location into consideration in every aspect in order to create a more comfortable home, perfect for the environment, while retaining a charming character too! So while each part of this home interior is amazing in its own right, the warming effect of natural lighting has not been forgotten in the design. Just stare into the uninhabited space surrounding this home and be transported to another time! Can you spot the light house? This area was once a well-known fishing community and even though that tradition has long since been forgotten, city-dwellers now use this serene and tranquil space as a means to escape the hustle and bustle of chaotic London… a mere two hours’ drive from the peace and quiet of this desolate site. Well that brings us to the end of this Ideabook, but if wooden homes are your thing then: A Wooden Family Home of Stylish Simplicity might suit you too! 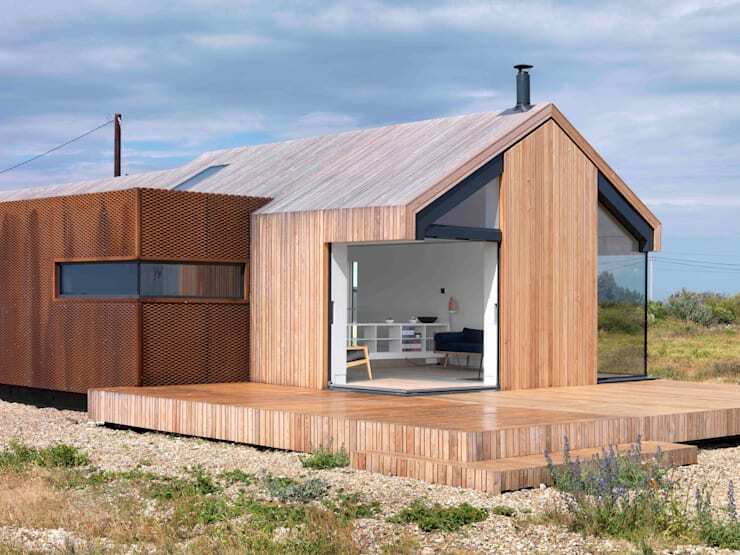 Would you choose a wooden home at the seaside? What is your favourite element of this home? Please tell us in the comments below!